Italy/France/US, 1958, 106 minutes, Colour. Gina Lollobrigida, Vittorio de Sica, Dale Robertson. 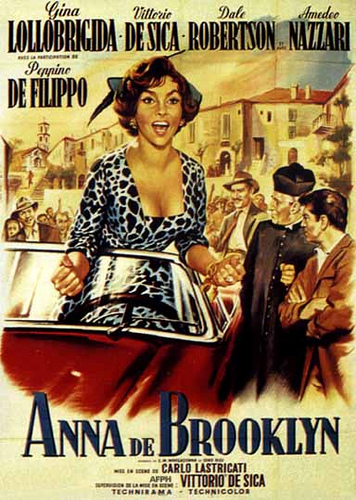 Anna of Brooklyn is an amusing lightweight farce about an Italian migrant returning after a wealthy marriage as a widow to her home town in Italy. The characters are the usual gallery of stock Italian characters from the blacksmith and mechanic to the women gossiping in the village, to the parish priest. It is a star vehicle for Gina Lollobrigida and she makes the most of her glamorous style. Dale Robertson is rather stolid in this Italian setting. Vittorio de Sica, who is credits with artistic supervision of the film, twitters around in the humorous conventional Italian parish priest style. Conventional farce. 1. An entertaining Italian farce? For Italian audiences, Americans, international audiences? The quality of uts entertainment and its appeal? 2. The conventional presentation of the Italian village and is characters? Italian mannerisms , emotions? The conventional material about the eligible widow, the eligible bachelor, the suitors? The parish priest? Marriage, customs, sexuality, religion? 3. The colour photography, use of the wide screen, music? Special effects for creating the atmosphere of the town? 4. The basic plot and audience response to it, especially in terms of migrants and the American dream? The return to Italy? The comparison of Italian life and tradition and American wealth? 5. Gina Lollobrigida's style as Anna? Her obvious glamour? Sexuality? The eligible widow who returns after making such a success of life and marriage? Dress, wealth, car, manner? The humour of her use of American slang? Her being welcomes back, her response to the welcome? The various suitors and her response to the Bron, the cinema proprietor, the chemist ? and his mother? Her eye for the blacksmith? Her being honoured in the town, and her control over people? Relationship with the parish priest and his advice? Being spurned by Raffaele? Her determination to get him? The various wiles she exercised to attract him? The final happy ending and marriage? 6. The stock characters in the village: Vittorio de Sica's parish priest and his fussiness, religious advice, confession, the Sacraments, sport, gossip? The Baron and his place in the town's hierarchy, the cinema owner, the chemist and the pressure of his mother? Their various devices to attract Anna's attention? The contrast with Raffaele as the strong burly type with the reputation of a woman-chaser? The ironies of the suspicions and the devices to find the young man courting the young girl? The humour to be gained from the character who was dumb and his transformation? How well did these characters fill in the picture of the village? 7. The humorous sequences and the style of Italian farce? 8. The more serious issues of marriage, tradition, the place of men and women in Italy, the bringing back of American styles to the old country? 9. How appropriate the happy ending for this kind of film? How pleasant a film, how much material for entertainment, for reflection on basic human themes?